The impeccably researched and vividly rendered account of the forgotten quest by Christopher Columbus's son to create the greatest library in the world—"a perfectly pitched poetic drama" (Financial Times) and an amazing tour through sixteenth-century Europe. In this innovative work of history, Edward Wilson-Lee tells the extraordinary story of Hernando Colón, a singular visionary of the printing press-age who also happened to be Christopher Columbus's illegitimate son. At the peak of the Age of Exploration, Hernando traveled with Columbus on his final voyage to the New World, a journey that ended in disaster, bloody mutiny, and shipwreck. After Columbus's death in 1506, the eighteen-year-old Hernando sought to continue—and surpass—his father's campaign to explore the boundaries of the known world by building a library that would collect everything ever printed: a vast holding organized by summaries and catalogues, the first ever search engine for the exploding diversity of written matter as the printing press proliferated across Europe. Hernando restlessly and obsessively amassed his collection based on the groundbreaking conviction that a library of universal knowledge should include "all books, in all languages and on all subjects," even material often dismissed as ephemeral trash: ballads, erotica, newsletters, popular images, romances, fables. 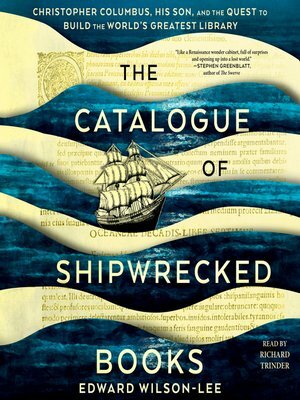 The loss of part of his collection to another maritime disaster in 1522—documented in his poignant Catalogue of Shipwrecked Books—set off the final scramble to complete this sublime project, a race against time to realize a vision of near-impossible perfection. Edward Wilson-Lee's account of Hernando's life is a testimony to the beautiful madness of booklovers, a plunge into sixteenth-century Europe's information revolution, and a reflection of the passion and intrigues that lie beneath our own attempts to bring order to the world today.